they are all bad. one i hit a window with my hand. one i tripped on a power washer and mashed my knee into concrete. another scar same knee, dog knocked me down and i got three stitches. one was an operation behind my ear. one was a large shard of glass jamming into my instep. i think thats all. I do not LIKE question 50! It brought back toe curling memories of my own shard of glass! UGH! #28 - no one would pay me either - and I would NOT do it if they would! (sicko!) LOL! I actually prefer Six Flags to Disney... but maybe that's because my KIDS preferred Six Flags... and we had season passes so we didn't feel RUSHED to do it all in one day (or 3 days ... or a week). Whatever... we never found it possible to "complete" Disney even when we went for 8 days! I think it would need a month! 50 made me cringe too. 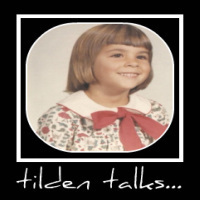 Hey, Tilden! You are all signed up and on the list for the NE Bloggers! I'm glad I got to read all your questions/answers so I could get to know you a bit. Number fifty made me wonder if slipping on the orange slice left a scar.